Manchester City striker Sergio Aguero is set for a month out with a hamstring injury suffered on international duty. The 27-year-old, who scored five goals in City's win against Newcastle last weekend, lasted just 22 minutes of Argentina's defeat to Ecuador. 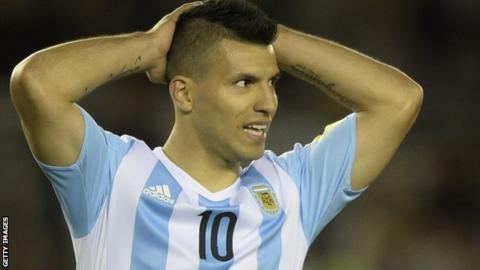 "I think I'll be a month without playing," Aguero told TyC Sports in Buenos Aires. City's problems increased on Friday as David Silva came off in Spain's 4-0 win over Luxembourg with a sprained ankle. The 29-year-old midfielder hobbled off early in the first half as a result of a challenge by midfielder Lars Gerson. Spain manager Vicente del Bosque said he had no timeline on a return for Silva. Aguero could miss four Premier League games - including the first Manchester derby of the season on 25 October - and two Champions League fixtures against Sevilla. His absence leaves City with just Wilfried Bony as a recognised central striker, with youngster Kelechi Iheanacho in reserve. See all of City's fixtures here.